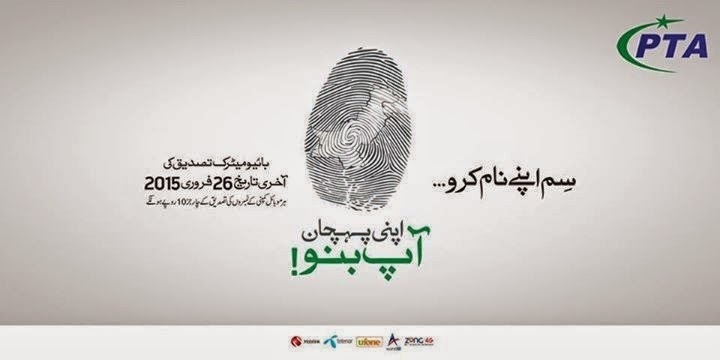 Biometric verification of mobile Sims is now mandatory in Pakistan. In Pakistan telecommunication Authority issued deadline to all cellular companies to convert 103 million prepaid Sims through biometric verification system. As I have seen long queues in front of National Database and Registration Authority offices to remove discrepancy of thumb impression verification. It is one of the good steps taken by government to verify all cellular Sims through biometric system. As this task is not easy for cellular companies but they are trying hard to accomplish their duties till deadline given by government of Pakistan. I have also gone through this process of verification and faced various problems like others. One of the major issues is the mismatch of thumb impressions. For verification purpose it is guided by cellular companies to visit NADRA for removing thumb impression's verification. I would say for this verification process will take more time to verify the sims of subscribers and this process may not be completed within given deadline. People are facing difficulties and inconvenience therefore, government should extend the deadline. Government of Pakistan has specified a deadline date that is April 13, 2015, whereas cellular companies stated 26, February, 2015. Furthermore, I would like to say that NADRA is charging Rs 10 for this thumb impression verification process from cellular companies. Same goes to cellular companies they compensate their cost from subscribers. I thought that government should not impose any charges on cellular companies because in the end the cost are compensated from subscribers. Hence, this is an effective step taken by government of Pakistan against terrorism activities in the country. Around 40 million have been verified via Biometric verification system so far and target is to verify 103 million which has to be completed by 26 February.